A pledge is a type of gift in Causeview, where a constituent promises to give a certain amount of money in installments over time. A payment toward the total pledge amount may be made at the time that the pledge is saved in Causeview, and a schedule for future payments is automatically generated by the application. 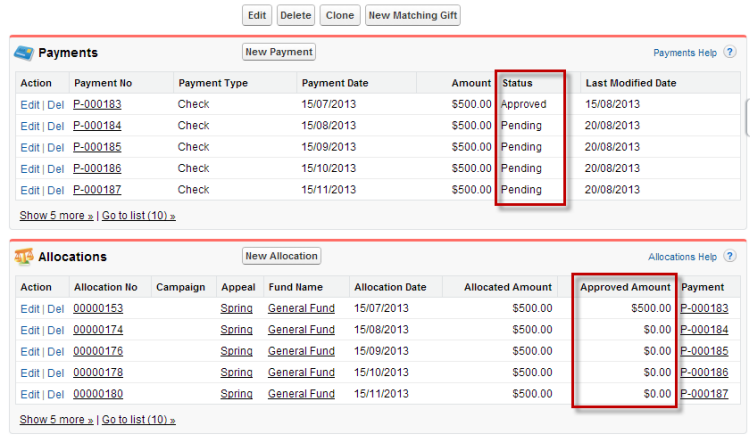 Over time the pledge must be managed in order to edit the schedule or submit completed payments. There are several ways to interact with a pledge, but you must first open the existing pledge transaction and view the details. 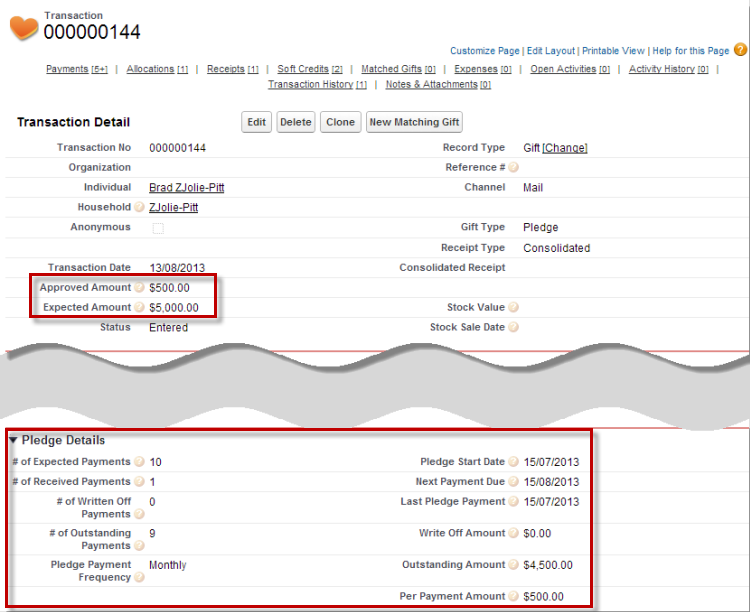 There are many ways to locate and manage a pledge in Causeview. If a constituent has an outstanding pledge, Causeview will provide a link to the pledge when you attempt to process a gift batch item for that individual or organization. You can also access a pledge through the “Open Pledges” view in the Transactions tab. Sorting pledges by Individual or Organization name can help to find a specific constituent’s pledge. If you need manage a specific pledge for a known constituent, you can locate the pledge through the related list of transactions on a constituent detail page. An open pledge detail page has much of the same information as other transaction detail pages, but some information is particularly important when managing pledges. For example, in an open pledge like Brad ZJolie-Pitt’s, the “Approved Amount” and “Expected Amount” for the transaction differ. While several payments exist in the system, only the first payment is approved. Information about the payments, dates, and gift amounts associated with the pledge accumulates in the Pledge Details section of the detail page. For further details about pledge payments you can consult the Payments and Allocations related lists, where future payments and their associated allocations are created and awaiting approval. You may notice the “Pending” or “Committed” status of future payments, and that the Approved Amount for incomplete allocations is set to “$0.00”. You can also view the future dates for planned payments and allocations associated with the pledge.